Hurricane Harvey has brought record-breaking rainfall and severe winds to southeastern Texas, with extreme devastation across the state. The damage will continue as Harvey traverses the Gulf Coast. As expected, Hurricane Harvey has also obstructed the movement of cargo across the southeastern portion of the United States. Port Houston closed for 7 days, and though it’s reopening on September 1, it may remain closed to large container ships for at least another week or two. Movement of containers into and out of the port will depend on the roads, many of which are not yet navigable. Furthermore, both Union Pacific and BNSF Railway, two of the country’s largest railway networks, have placed an embargo on all rail cargo headed to the port. Houston is one of the busiest hubs for U.S. imports, and the damage will have serious labor and economic consequences in the coming weeks. In normal circumstances, logistics networks are made up of separate but interconnected nodes. The ocean carrier, the port, the rail, the trucking company: all are distinct entities, each with their own systems and ways of doing things. In a natural disaster, as each node adjusts to rapidly changing circumstances and its own specific challenges, the ripple effects test the strength of the entire network. As Hurricane Harvey approached, first, Port Houston closed. Trucking and rail companies suspended operations. 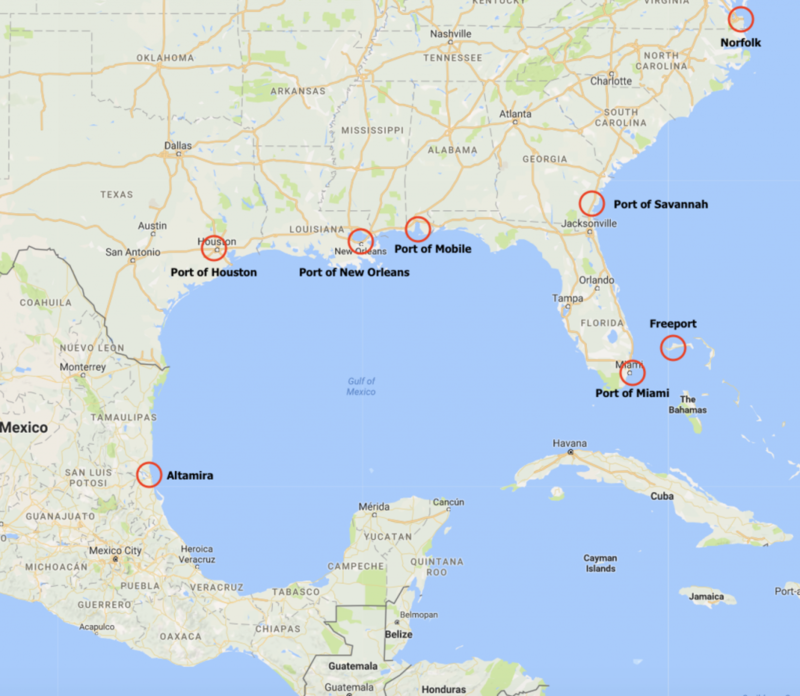 Ocean carriers watched closely, putting contingency plans into place, and eventually deciding to skip Port Houston and/or divert vessels to smaller nearby ports such as Freeport, Birmingham, Mobile, and Norfolk. There are limits to how much advance planning can really be done, but in general, every node in the logistics network has some degree of contingency planning (though there is certainly variation in how well they communicate updates and changes). Ocean carriers tend to have high-level plans in place for riskier regions, and if a natural disaster strikes, they’ll adapt the plan depending on the situation and the locations of their vessels. Perhaps, if the ship is already close to Houston, it stays close to the port for a day or two; as the forecast worsens, it sails to a nearby port. The Houston cargo might be discharged at Birmingham, AL, and trucked out from there. For a farther-away ship, the carrier may decide to divert the vessel as it sails across the Atlantic, having it stop at Freeport (in the Bahamas) to discharge the Houston cargo before making its next call. The next vessel might pick it up, or the carrier might opt to send an extra loader vessel — a ship they pull out of rotation and send to Freeport empty — to pick up the cargo and send it to Houston when the storm subsides. Air freight is able to be a bit more nimble. Houston’s two major airports were closed for several days, but, as our SVP and Global Head of Air Freight, Neel Jones Shah, noted, air shipments moving into and out of the U.S. were re-routed to nearby cargo hubs such as Dallas/Fort Worth, Chicago, or Atlanta. We saw pretty minimal disruption to our clients’ air shipments. The only centralized location for all of these contingency plans and updates — from the ocean carrier, the port, the rail company, and the trucker — is the freight forwarder. We take it all in, we extract and share the necessary information, and we strategize about the most economical, expedient way to keep the cargo moving in the right direction. Technology makes this easier. With unified, structured data, it takes just a few minutes to pull a list of all active shipments en route to the Port of Houston — or, to get more specific, those that are less than 7 days out from port. Our Operations team was able to begin doing this as soon we saw the first Harvey storm warnings, so none of our clients were caught too off-guard. We pulled similar reports last week, too, when two typhoons hit southern China, and all flights in the region were grounded. Data isn’t the end of the story, though. Once we have these shipments on our radar, relationships take over. Nerijus Poskus, our VP of Global Pricing and Procurement, communicates with our carriers on the ground. Our Operations Managers get the inside story from their contacts at the ports and trucking companies. When possible, we re-manifest containers at alternate ocean and rail ports, and truck them to their final destinations in an effort to avoid additional delays. Clients can follow along, tracking their transshipped or re-routed containers in real time. Port Houston has announced that it will reopen Friday, September 1. Our contacts at the port have said that the container terminals experienced minor flooding, but did not incur heavy damage. Still, it will take some time for the port to resume completely normal operations. The U.S. Coast Guard has not yet cleared the shipping channel to reopen for large container ships. Until the floodwaters subside, it will be difficult for port employees and truckers to even get to the port. And, of course, many residents of the area are dealing with the impact to their families and homes. The recovery process will be lengthy, and fortunately, there are many initiatives underway to raise funds and mobilize volunteers. Our nonprofit branch, Flexport.org, is working with some of our clients as well as with nonprofit partners to support the crisis relief efforts. If you’d like to pitch in, the New York Times has gathered a number of reputable organizations here. Anders oversees sales and accounts for the West Coast region of the US, where Flexport is headquartered. He joined Flexport after +10 years at Maersk where he held multiple leadership roles in Operations and Commercial across Europe and China. He has a B.S in Logistics, an M.S. in Economics and an Executive MBA from Columbia.